Billy and I have been on the road meandering through continents for almost three decades. While we like to think of ourselves as spry, flexible and ready to take on the world, truth is, we are no longer twenty or thirty years old. 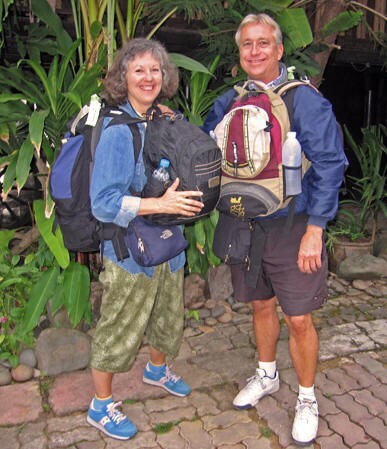 Traveling at our age of 65 presents challenges that we didn’t have when we were younger. Energy levels have changed and our bodies require different comforts in order to feel well. If you are in your fifties and sixties with active wanderlust, independent journeying is still possible. Take advantage of what we have learned over the years. The value of sleep is a priority that we protect, since its absence is felt for the next day or two – creating havoc in moods, energy level and even decision making. Whenever possible, we no longer take red-eye flights. Air travel has become more complicated in recent years and it’s enough to handle the new requirements, the lines, and the disorientation of time zones without adding severe sleep schedule interruptions. Besides, what’s the rush? In years past we’d blow into a new location without a care, knowing we would find some kind of hotel arrangements. Now, we are more inclined to reserve a room for our first night in a new city or town, or at least have a definite address where our taxi can take us. Once we arrive, we can scout out a more suitable hotel if we aren’t pleased with our first choice. We also check the beds for firmness, get a quiet room off the street if possible and we pay a bit more for better quality. Sometimes an afternoon nap is the height of luxury and can be the pick-me-up needed for the rest of the day, especially if there is an evening event planned. We’re retired, so why not enjoy it? Allowing time for rest instead of continuous motion can be delicious. We don’t skip meals and run on empty. Solid, quality, protein-based meals and snacks have always been a focus for us. We’re the machine that makes our lives run, and this machine needs proper fuel. Light-headedness, indecision and fatigue due to lack of nutrition contributes to needless bickering and is something we avoid at all costs. Why make things harder on ourselves? We are sure to eat at regular intervals and to bring travel food with us on buses, trains, planes and even if we are out day-tripping. Dehydration is another important consideration and we remember to bring bottled water with us wherever we go. Tip: There is no need to purchase expensive bottled water at the airport concessions. When traveling by plane bring an empty water bottle with you through security. Once through, find a drinking fountain and fill it up there. We travel full time, and it’s more pleasurable when duties are shared. 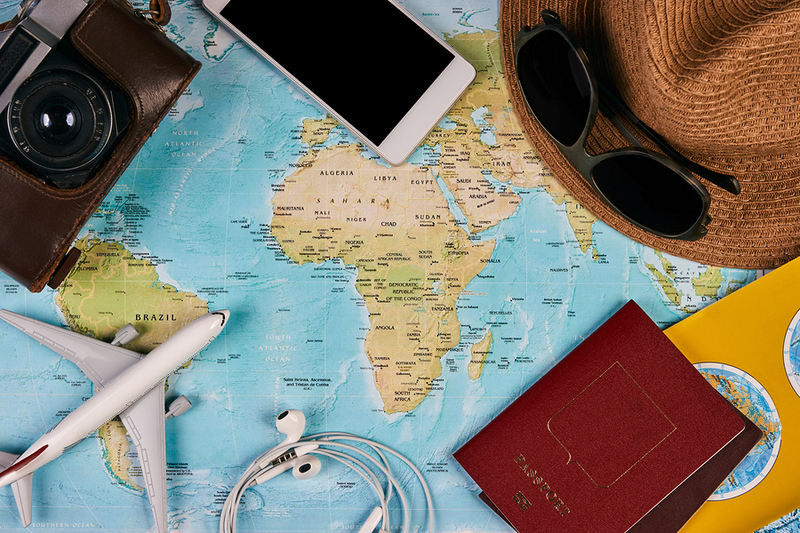 Destinations and travel routes must be determined and figuring out which sort of transport we’ll take and whether or not visas are required all needs to be researched. Tickets might have to be purchased ahead of time, lodging located, and arrangements for financial management to cover expenses while on the road has to be thought through. Even packing travel food is an essential element of successful journeying. In your partnership, decide who will take care of what, realizing that each of these categories is important. When we leave our hotel room we have a system that prevents sour surprises. Billy goes down to firm up our bill, and I do a ‘room check’ or ‘walk through’ before we turn in our keys. I look under the bed, in all the drawers, in the bathroom, and on all the shelves to be sure we haven’t left something important behind. This prevents lost and forgotten items from becoming an issue and interrupting our travel plans. When we traveled through both islands of New Zealand on the Magic Bus, Billy would stay with the crowd to grab our luggage while I went ahead to choose our room and pay for it. This allowed us to get both the best choices of rooms and our bags without wasting time waiting in two lines. Tip: Although it might be different in your partnership, when searching for a hotel room, I’m usually the one to decide on where to stay. With most men, all they need is a bed and bathroom, but we ladies seem to have other requirements. So, to prevent disappointment or needless fussing, we have found that it’s best to let me decide. Making notes of where we have hidden our valuables in our home base location while we are on the road has proven important several times. We write things down on lists instead of committing them to memory and we’ll email that list to ourselves so we don’t lose it. Being away from our home bases for months, even a year or more at a time, can cause us to forget our best and most secret hiding places. If we put our treasures or documents in such a good place that even WE can’t remember where they are, returning home can be a stress-filled event. Now we simply check our list and refresh our memories. Consciously deciding to make our travel days shorter when we are on the road has proven to be rewarding also. 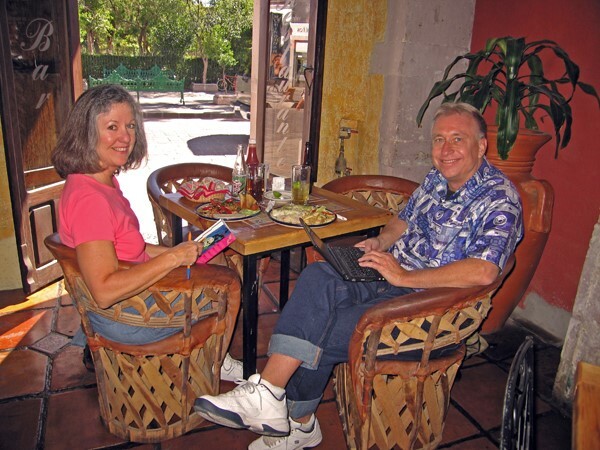 It still takes us close to thirty hours to get to Asia from our place in Arizona, but if we are traveling on the ground, we break up our destinations into manageable time bites to make it possible for us to enjoy the journey itself. It’s not a race, and we’re not in competition with other travelers. We prefer this easy-going approach. For instance, while traveling by bus in Mexico we’ll split up a 13-hour bus ride into a couple of days. This way we are not worn out for our destination, we don’t arrive late at night with all the problems that it entails, and we get to experience another town along the way. 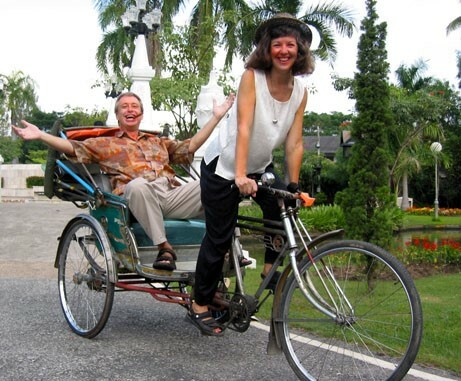 We utilize public transport or hire a driver wherever we go. Leaving the driving to others reduces our stress. We don’t have to worry about vehicle maintenance, where the next filling station is, if there will be a break down, how to fix our vehicle in a foreign country, or whether we have taken a wrong turn someplace. Through all these years of traveling from country to country we still utilize backpacks for their rugged practicality and ease of transport. Today’s durable, light weight and comfortable backpacks have come a long way from those of years past. Weight is distributed evenly on our backs instead of lugging something one-handedly on either side of our bodies, and it leaves our hands free for paying fares or reading maps. For efficiency and convenience, we place the same items in the same location in our packs each time. There is no jumble. In this way we maintain a sense of order while on the road and it cuts down on any mental confusion allowing us to enjoy our travels. We are less likely to forget an item or misplace it, because it has its own spot. If for health reasons you cannot carry your luggage weight on your back, be sure your baggage is built lightweight yet sturdy, with compartments inside and has wheels on the bottom for moving your belongings quickly. Don’t be afraid to ask your taxi driver or someone at the hotel desk to help you with your cases. It’s worth the tip and will save wear and tear on your body. Be sure to have a daypack with you when you travel. In this manner you can carry anything of importance close to you at all times. This may be your medicines, your digital equipment, your maps or travel food. And if you go to the market while on your trip, you can easily carry the items back to your room. Over the years, we have found that what we pack has changed also. Now we make room for our digital equipment and cords, cell phones, netbook computer, vitamins, personal medications and health aids like a TENS unit. We have a calendar to mark important dates like visa renewals or when to catch that plane. And our online Yahoo! Calendar is used for reminders to send checks so that we can stay financially current. Tip: When looking for a practical travel bag, simply Google ‘lightweight travel luggage’ to clarify what your choices might be. You can order online, or at least have a solid idea of what you want when you go to your favorite travel shop to purchase. 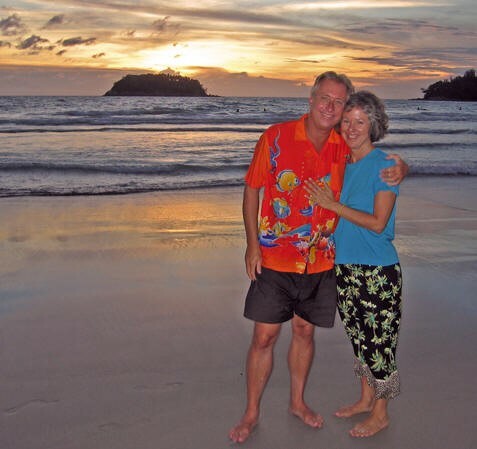 We’ve had 27 fruitful years of world travel and look forward to many more. Even though we have aged, and some of our methods and equipment have changed, we’ve adapted so that we can continue our chosen lifestyle with both pleasure and ease. Remember, if we can do it, you can too!